As with most cities around the world, a short three-day visit does not do any justice, nor is it possible to cover all that the city has to offer. So it was on this trip, whatever we chose to see was merely scratching the surface and other travellers may return home with a totally different story. Our first morning of sightseeing took us to the old city called Gradec, situated on the hill of Gornji Grad. Dating back many centuries, this part of Zagreb is today a local government unit. 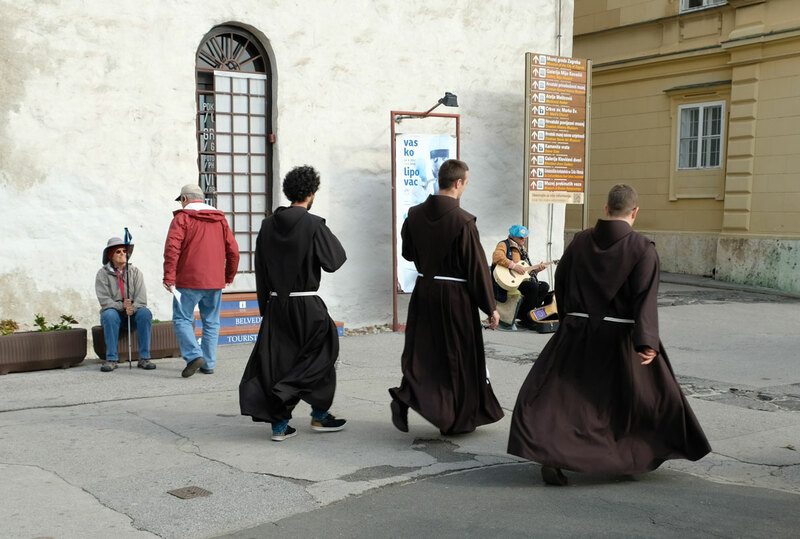 Together with Kaptol, the seat of the Roman Catholic archbishop of Zagreb just below the hill, they form the oldest parts of the city, founded way back in the Roman times. In this part of the city we also found Atelijer Ivan Meštrović, the former home to the world-famous sculptor and architect Ivan Meštrović. Nowadays it is a museum show piecing some of his most notable works – it is indeed a real gem hidden in the back part of the old town. Meštrović was a contemporary of Pablo Picasso, but his works are more in the tradition of August Rodin. A few blocks further down from the Meštrović museum you will find an interesting display of naïve art at a museum with the same name. The tourist brochure claims that the naïve art originated in Croatia in the middle-20th century as a highly colourful and often political style of painting. This museum is home to about 80 paintings and the images are undeniably fascinating. Across the street from the naïve arts you will find the even more popular Museum of Broken Relationships, where people from around the world have shipped their letters or other specimen symbolising the memories of a broken heart. The museum is filled with mementos of relationships that have in one way or another gone wrong. It first started here in Zagreb and has toured around the world stockpiling an amazing array of items and descriptions that may have you to think twice. Funny, yet serious, it won the Kenneth Hudson Award in 2011 for the most innovative European Museum. The streets of Zagreb also invite you to stroll along, and especially relaxing is the park that stretches from the railway station almost to the main square, named Trg bana Josipa Jelačića. The square is the hub of the tram system, a short ride of thirty minutes will set you back only four kunas, ten for a longer trip. One of the most visited Zagreb attractions is the Zagreb 360 degrees observation deck. It is on the 16th floor at the top of the “skyscraper” on the main square. 60 kunas (8 Euros) admission and the café on top sells drinks only, no food. As darkness falls on the capital city, well worth visiting will be some of the bars hidden in the darker back streets. Here you will meet the locals where you can chat about almost everything. English is fairly widely spoken. 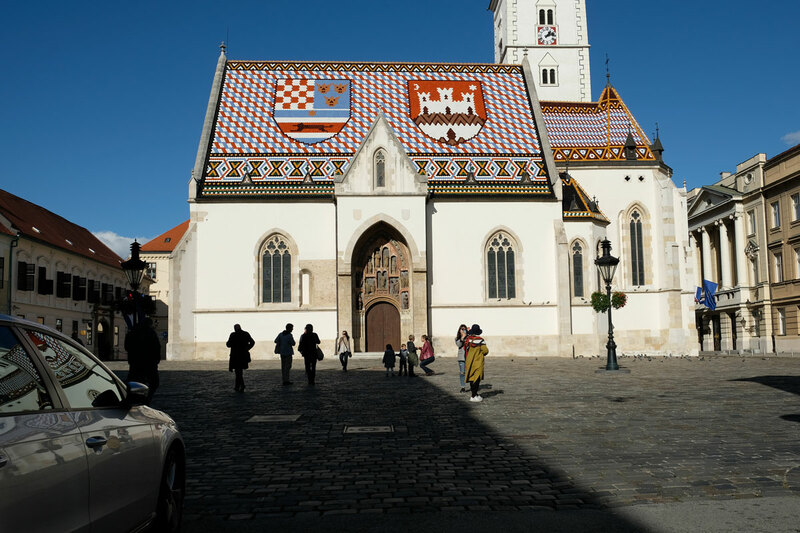 The old city of Zagreb called Gradec. Getting from Zagreb to our next destination was easy. There is a direct train that leaves the main station four times a day for the cost of around nine euros. Two and a half hours later you will step on the platform in Ljubljana, the capital of another small country in what was once a federation of states called Yugoslavia, but now an independent member of the European Union. Slovenia is part of the Schengen area, so a passport control is part of the fun on the train. It is a pleasant journey through colourful and rich landscape, and as we approach the Slovenian capital we can see the snow-clad mountain to the north. When Croatia finally attain Schengen membership the journey will be even shorter. Why visit Ljubljana? 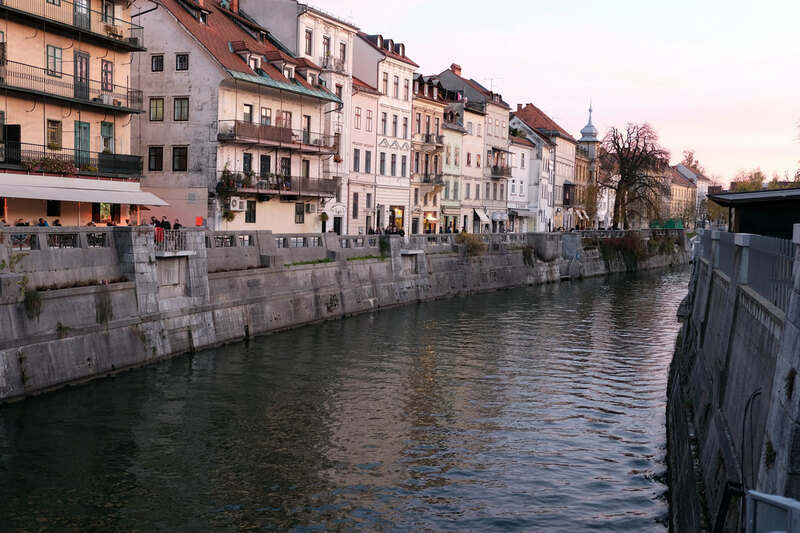 Both its residents and numerous visitors perceive Ljubljana as a city built on a human scale. Despite the fact that it ranks among the mid-sized European cities, it has preserved its small-town friendliness, and, at the same time, it has everything that all the larger capitals have. So speak the words of the official tourist authorities. The pedestrianised centre of the town is quite big and properly maintained, but bears marks of too large influx of visitors, or tourists if you like. This is also reflected in the prices of the cafes and restaurants in that area. Pricewise Ljubljana is more expensive than Zagreb, and the food in the restaurants we happened to visit was of rather poor quality. Ljubljana also has its own version of a 360 degrees observation deck with a café on top, and no charge for taking the lift. It is in an art deco building from 1933, named Nebotičnik, and was apparently at that time the tallest building in Europe. It has good views on all sides all the way to the Julian Alps. It is advisable to do some research on public holidays before leaving home, we happened to arrive on Reformation Day and the next day being All Saints Day. Most shops were closed and the city was quiet. Unfortunately, Ljubljana is on the verge of becoming a theme park, some sort of Disneyland. It is when a city becomes the victim of its own success with visitors outnumbering the locals and almost all businesses cater to the influx of tourists. They come to see the well-kept and beautiful buildings and the cityscape, but end up queuing for coffee, cakes and their drinks. The San Marco Caffe, Trieste. Trieste was next on our list, and the last stop before returning home. It is a beacon of Italian culture, literature and seafaring, beautifully located by the sea with hills extending into Slovenia on three sides. The bus journey from Ljubljana was only an hour and a half on motorways, and temperature was suddenly summer like compared to the Slovenian capital, where morning temperatures were hovering around freezing point. Trieste has produced and inspired numerous artists, and many masterpieces of world literature were written here. Italo Svevo and Umberto Saba were born in the city. James Joyce, one of the most passionate lovers of Trieste, lived in the city for many years. Together with his wife he spent quite a few years in the city in a voluntary exile from Ireland. He survived teaching English. Two of his children were born in Trieste. Nowadays, he has a statue himself on one of the bridges that crosses the canal. As for food, Trieste cuisine is a unique mix of Italian and German-Austrian tradition. Sauerkraut is an integral part of several popular dishes, like the jota soup (made with sauerkraut and beans). The local sausage is very popular as well. In ancient times this area was settled by the Illyrian tribes. The Romans called the place Tergeste in reference to the fact that it took them three battles to conquer these lands. It became a military outpost and an important port. During the following centuries, it was conquered by Byzantium and Venice, but for most of the second millennium A.D. the city was under Austrian protection. 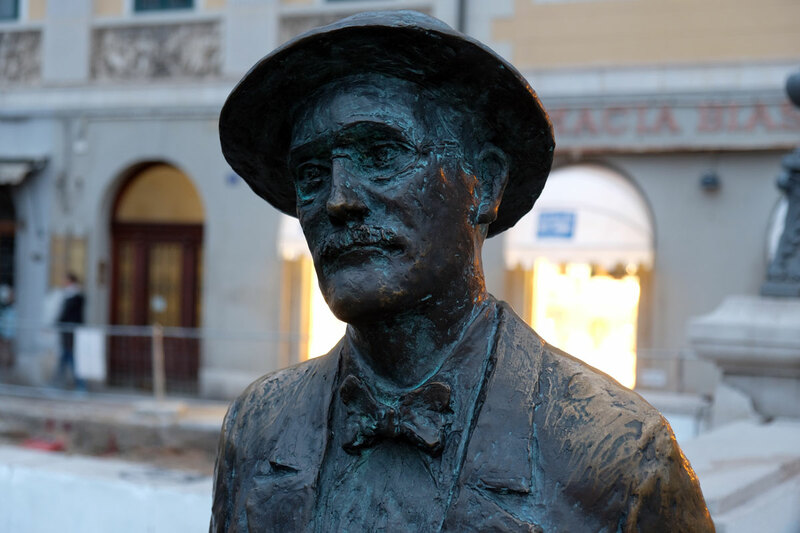 James Joyce has his statue in Trieste. Trieste, for much of the Middle Ages, was nothing more than a small settlement with no particular strategic importance. However, during the 18th century the city became a crucial transport hub to the Austro-Hungarian Empire as their only port on the Adriatic. Hence, sauerkraut and sausages. The city is also the headquarters of the coffee company Illy, the world-wide coffee brand, and historical coffee houses dot the streets. Trieste has a very rich coffee culture and its cafes offer some of the most imaginative variants of the black beverage you could ever think of. 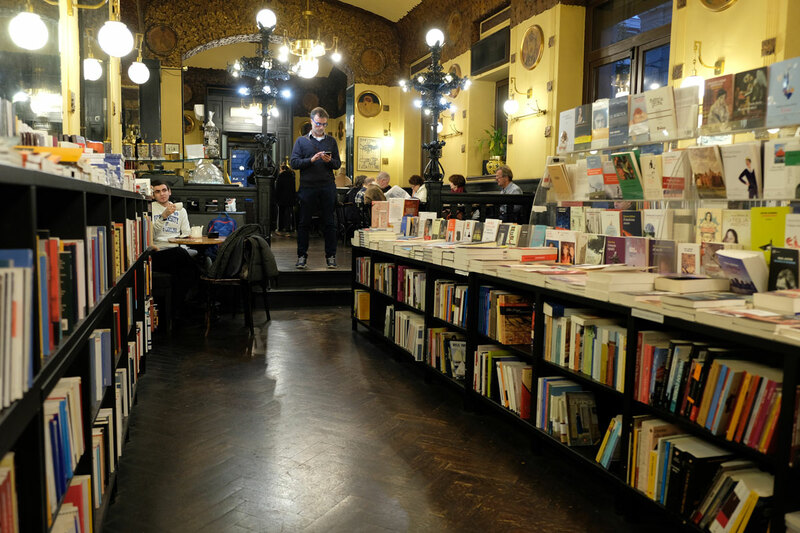 The famous San Marco Caffe was one of James Joyce’s favourites, today a book café with a smelly toilet, but full of people sitting for extended periods reading newspapers or books. The castle on the top of one of the hills, named Castello di San Giusto, is well worth a visit. Besides being a symbol of the city and hosting a great view of the city, it is also home to an interesting photo museum or gallery. We accidently ran into an interesting exhibition about the Hungarian-American photographer Robert Capa and his work with the American forces in Italy from August 1943 to February 1944. A display of original photographs as well as audio-visual exhibits about the progress of the war and some of Capa’s out of Italy photographs from the war as well as his life span. Born in Budapest in 1913 as Endre Friedman he is one of the most influential photojournalists of his time and a co-founder of the famous and well-respected Magnum photo agency. Getting to the top of the hill is basically an easy walk, but there is also a small bus no. 24 at 1 Euro 25 cents.